Always the first to bring you exciting new trends, we have a super new mini trend we’d love to share with you. Pretty Pastels! The latest pastel mini trend is far from twee, it’s retro, mid century shapes teamed with soft pale colours to great effect. Soft pinks, blues and greens calming and stylish, a great addition to any living space. Pastel colours work brilliantly with retro designs and are easy to live with, pleasing to the eye and practical too! Pastels are always calming, who wouldn’t benefit from the introduction of a little calm in to our hectic lives. Pastels and neutral colours are perfect relaxing colours. If you choose to introduce pretty pastels we suggest the best places are living rooms and bedrooms! These are areas in which you relax and want to get away from the busy outside world.If you long for a calm relaxing home, next time you decorate think pale pastel. Pastel colours are often popular choices for bedroom decoration. Why not complete the look with the addition of a co-ordinating ceiling light. In the past finding a pastel coloured ceiling light may proved difficult to find, things have changed. Pastel ceiling lights are plentiful here at The Lighting Company with the addition of glorious silk shades and wall lights to our extensive range. 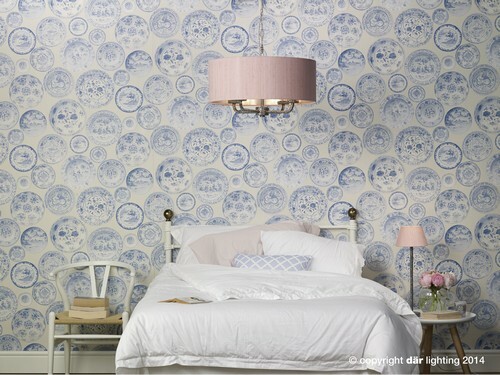 Team pure white light fittings with pretty candle shades to create a unique centre piece for your bedroom. Perfect bedroom, tranquil calming colours. There are many lights with these colour tones which would fit in perfectly with a matching decor. Pendants often come in a variety of colours and it is no surprise that there are pastel options. 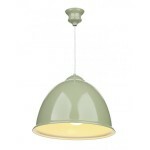 Pale green ceiling pendant light. Pendants can be used just about anywhere and most are able to be shortened at the point of installation making them suitable for rooms with both higher and lower ceilings. Kitchens and dining rooms are a great place to go for a retro theme and a pastel pendant would be perfect for lighting over the island or table. Metal painted pendants such as the light shown right can be painted in a choice of colours. Through our Bespoke Lights division we can offer a range of lights painted in fabulous Marston & Langinger colours for a small additional charge, contact us for details. Want a light made in your own choice of colours – we may be able to help! Next → Next post: Best Style of Ceiling Lights for your home?